ICM 1/72nd Polikarpov I-5 "Late"
The I-5 biplane was the result of considerable work on several contemporary designs, including Tupolev's ANT-12 and Polikarpov's all-wooden I-6. This project fell to Polikarpov to complete at a time that he was under detention for alleged "sabotage"-- having been accused, essentially, of being lazy and careless in his work. Working within the 'detainee Bureau' offices housed at Zavod 39 (which was, itself, a normal factory), the I-5 no.1 prototype (the project was known as VT-12) was completed at the end of April 1930. 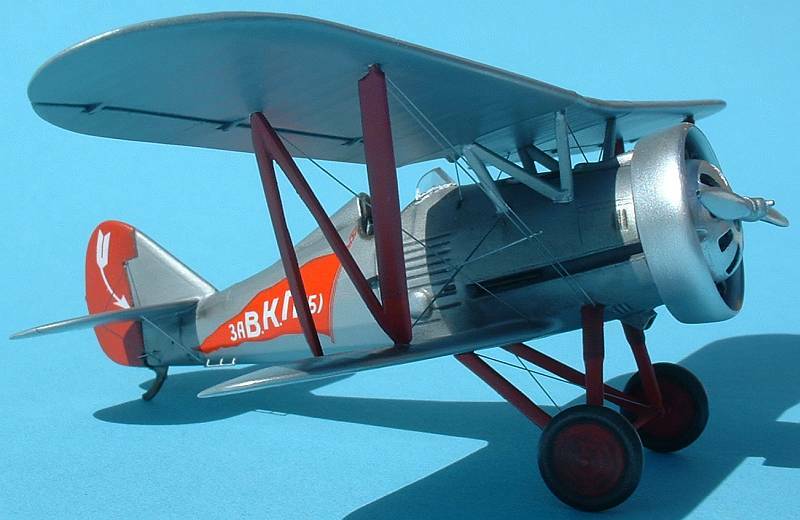 The I-5 was a neat single-bay biplane of classic configuration. The wings were braced by N type struts in addition to cabanes, and the upper wing featured a significant dihedral. 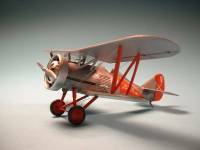 The fuselage structure was welded steel tube and stringers, covered with fabric, while the wings were wooden with ply sheet leading edges. Power was provided by the license-built Jupiter VI, the M-22, of 425 hp. Early examples featured a streamlined cowling with 'helmeted' cylinder covers, but later a more conventional Townsend type cowl was installed, which became standard. Armament included two PV-1 guns mounted below the cockpit on either side of the fuselage. Performance in the I-5 was good for the day; 280 km/h could be reached, and 1000m attained in the impressive time of 1.3 mins. Handling and maneuverability were exceptional under all conditions, and the flight behavior was safe for pilots of any ability. 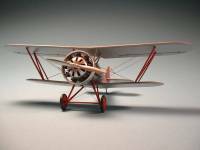 In all, 803 examples were built of this classic fighter, and many development schemes were mooted during its long and successful career. You can see just how this kit - and the early kit - looks in the box by looking at Ilya Grinberg's "in-the-box" article. Naturally construction starts with the cockpit. I decided to build this as close to out-of-the-box as possible so only added seat belts to the seat - plus, the stock cockpit is pretty complete as it is. Determining the position of the upper guns is difficult - I'm sure I don't have them in the correct place, but it's extremely difficult to see them when the fuselage is all together. I painted the interior using Polly Scale's Flat Aluminum, which can be found in their model railroad colors. (Thankfully. 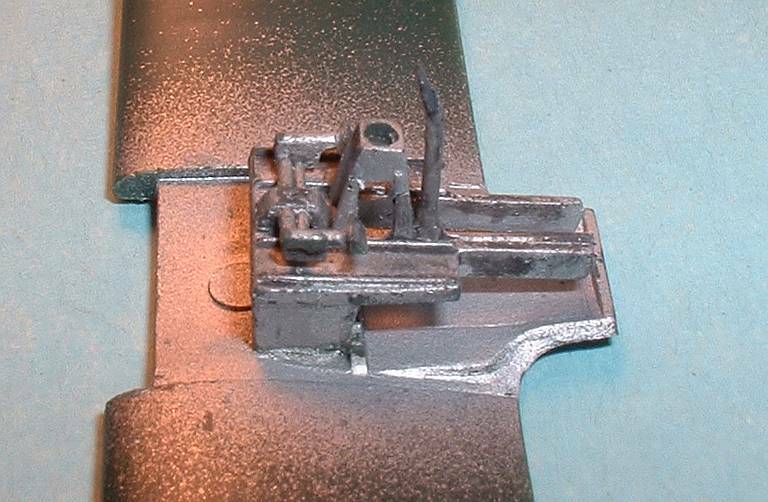 When Testor's bought out Polly Scale they cut the production of the Polly Scale "Metalline" series found in the plastic modeling paints, forcing modeler's to use their Model Master metallic acrylics. An error on Testor's part as the MM metallics are far worse than the Polly Scale ones.) Both an oil-wash and a drybrush with Polly Scale's aluminum complete the cockpit. While all four are difficult to see, adding the guns - especially the lower guns - are a must because all the barrels protrude. Unfortunately I couldn't get the upper gun barrels to "work", sticking out of the separate upper fuselage panel, so I cut the barrels from the gun stocks and glued those on as one of the last steps of construction. For the lower guns I opened up the holes the barrels protrude through just a little more so they would slide in with no worries. Now that the cockpit is finished the fuselage can be closed up. Little to no putty was needed on the fuselage seams. However, the same can't be said when I added the separate, upper fuselage panel as its fit was a tad difficult. After dry fitting and all, it still needed a little bit of CA and sanding to blend it into the fuselage. I left the engine, cowl, cowl-face and prop off until very last. That way I could paint the cowl and cowl-face separately from the rest of the model, since it was going to receive a different color. Once the fuselage was closed up and all seams deal with I added the lower wing. There was some dry-fit to get it to fit as snug as possible, and the majority of the seam work was on the underside, where the wing met the fuselage, both fore and aft. After that was glued on then the horizontal tail was glued on. This was, in fact, the worst fitting part of the model, taking some putty to get it to blend into the fuselage. Once that was taken care of the rudder/tail-skid assembly was fit to its area. This took a lot of dry-fit and sanding to get it to sit correctly, but thankfully little seam work was involved. There are areas on the kit that the instructions show where you need to create scratch-build parts for. These are the pilot's step, small "hand-holds" (at least that's what I think they are) on the rear of the fuselage-underside, and the struts going from the fuselage to the leading-edge area of the horizontal tail. I ended up going further on these by drilling out the "dimples" where each go to thread them through the fuselage. I felt this would give these smaller parts a lot of strength for those judges who don't pay attention when they handle models. In fact I was able to glue all of these on prior to painting, and didn't knock any off. Now it was time for painting. 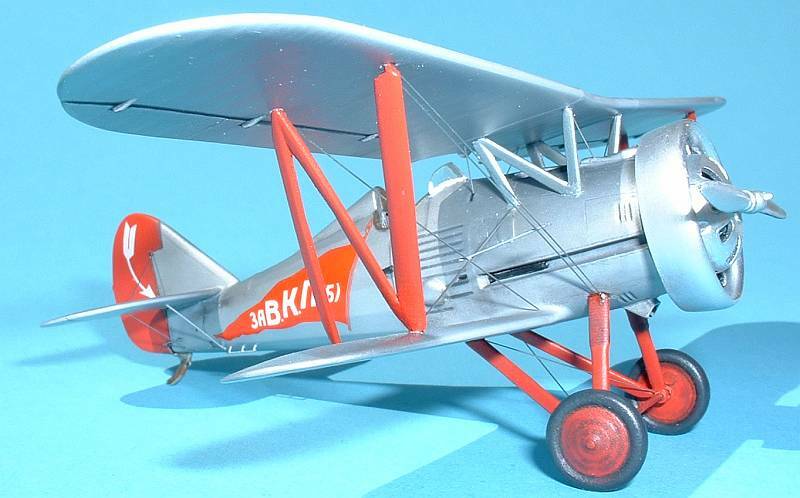 Since Pavlov's aircraft was finished in what could have been Aluminum I decided to take my first steps into using Alclad II paints. Prior to using them I gave all model parts an primer coat of Mr. Surfacer 1000. I used it from a spray can, and now wish I wouldn't have. The spray can coats the model too thickly resulting in loss of some of the finer detail. Next time I will definitely thin Mr. Surfacer out of the bottle and spray it with an airbrush. 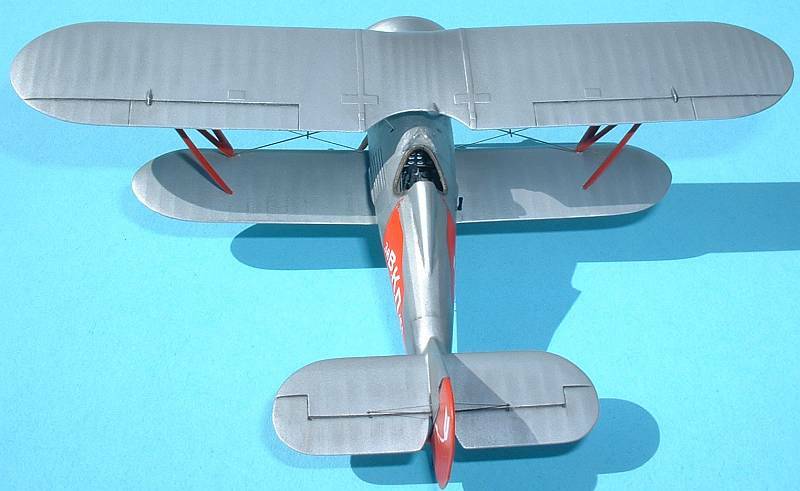 After letting the Mr. Surfacer dry for a few days I sprayed "Semi-Matte Aluminum" Alclad over the main aircraft parts. It went on like a dream and I'm glad I "took the plunge" to use Alclad (this coming from a tried and true acrylics painter). The Alclad dried quickly and I was able to spray missed areas again within minutes. 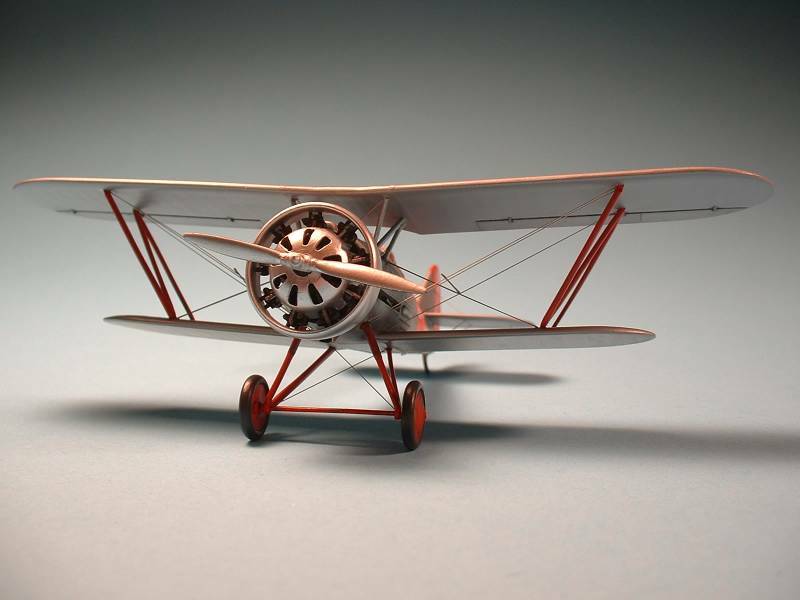 The cowl, cowl-face and propellor were sprayed with "Polished Aluminum" to give it the look that the natural metal areas were left unpainted versus the Aluminum. Personally I think it looks best this way. After a few days of drying the Alclad was masked and the red areas were sprayed with an acrylic red. (One thing I should have done and will with my next Alclad application - I didn't overcoat the Alclad with anything, and now wish I would have used Testor's Metallizer Sealer as I rubbed the Alclad off a few places like wing tips, etc.) After the red dried for a few days then I could move on to the decals. I had a little trouble with the decals initially, but after painting on Liquid Decal the decals went on with no hassles. On the rudder I brushed on some Future prior to decaling and once dry laid on the decal with more Future. I didn't feel the need to use Future on the fuselage decals and they went down with no silvering - again, testimony to the greatness of the Alclad. Now that the decals were on and set I moved on to final construction. I was able to glue the upper wing onto the center struts directly (which could be added prior to painting) and then glued on the interplane struts. 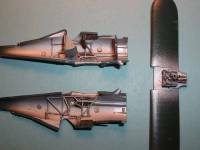 ICM has you build-up the interplane struts using two parts - if you build a "true" operational machine (Pavlov's was actually one of the last prototypes) then you'll need to replace the straight, front parts of the interplane struts (parts A17 and A20) with narrower stock. Pavlov's machine had wider struts here while the production machines used a narrower strut. (In actuality you can see that in the painting instructions included on the instruction sheet.) There was some gap filling to do when the two strut sections were mated as the gap was too great between these two areas. Something you might want to do prior to gluing the struts onto the final airframe. The landing gear went together without a hitch, although the holes in the wheels to insert the axle part of the struts should be drilled out a little. 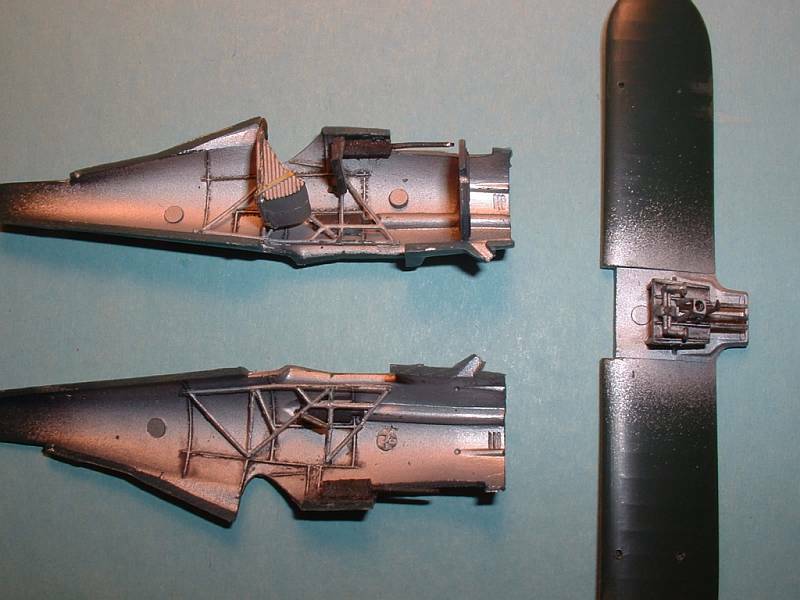 While I added the windscreen as the last thing (typical) you may want to glue the windscreen halves together early and test fit this to the fuselage prior to painting. Mine needed some adjustment and didn't come out very well. Rigging was accomplished using .005" stainless steel wire, and here is the biggest fault with the instruction sheet. ICM does not include a rigging diagram to go with the model, so references in this area are a must. Even with my references I felt like I had to fudge a bit of the rigging to get it to where I thought it should go. I oversprayed the main airframe with Polly Scale Satin to give it an overall sheen, as well as to help hide the CA glue spots (since I use CA to glue on my rigging). Once this was accomlished the engine/cowl/cowl-face assembly was glued to the airframe, followed by the prop (which was able to be kept free-spinning). 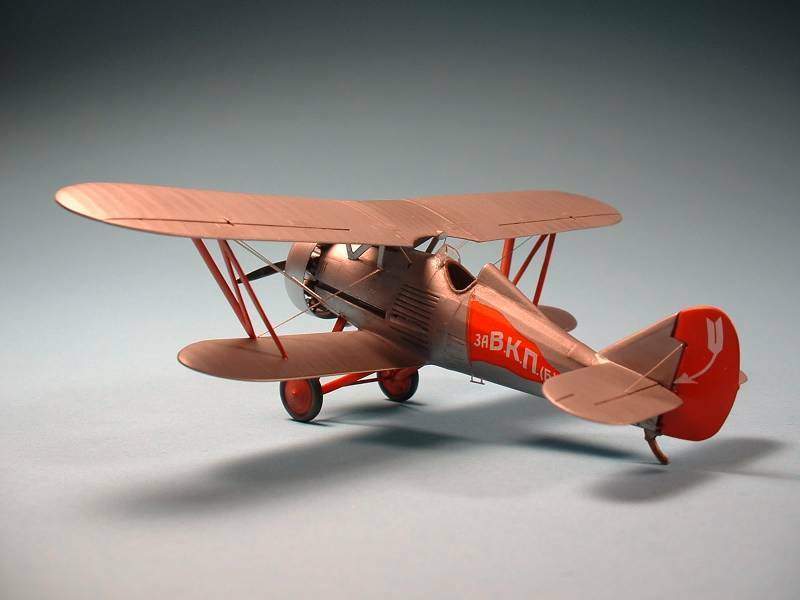 ICM include clear lights for the top of the upper wing, but these were not found on Pavlov's machine (but were found on most production models otherwise). In addition, ICM includes a windscreen with a "hole" cut-out for the gun sight (again, not used on Pavlov's machine). This is an excellent model of an generally unknown and unusual biplane. It was the first biplane model I have built where I need to do *no adjustment* on the struts to get the upper wing to sit correctly. Sure, I had to sand some flash away, but the fit was perfect with the struts out of the box. 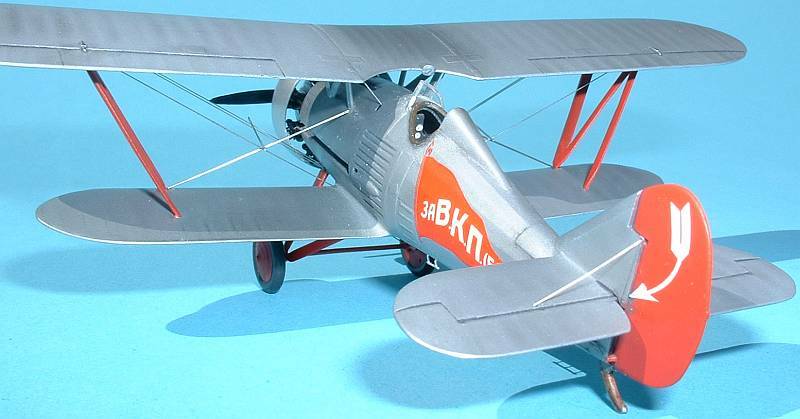 Completely unusual (and to be truthful I have yet to finish any of the "new" 1/72nd Eduard WW1 biplanes). The I-5 I consider very "handsome" and the Aluminum and red scheme of Pavlov's machine is really striking and makes the model stand out. I highly recommend this model, and everyone should buy at least one. 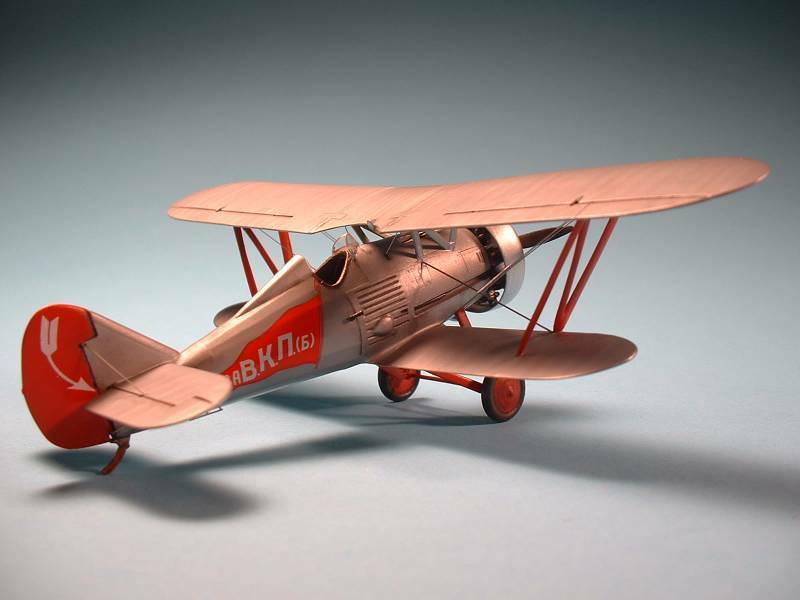 (ICM also released this kit as an "Early" version with a different fuselage and nose. ).